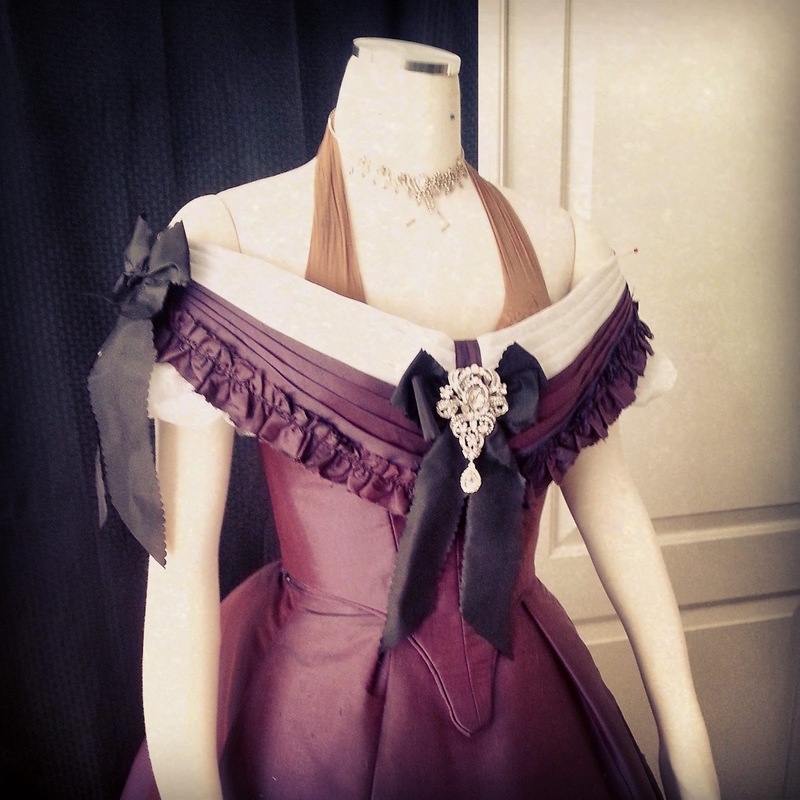 I couple weekends ago I was all a-tussle finishing the evening bodice for my new purple 1860s gown. 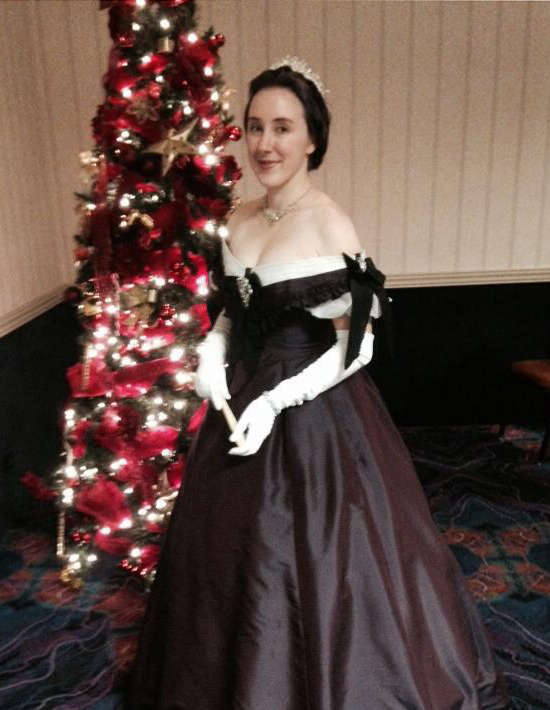 I intended to wear it to a local Civil War ball, and was happy to put the finishing touches on it a couple hours before leaving for the ball. 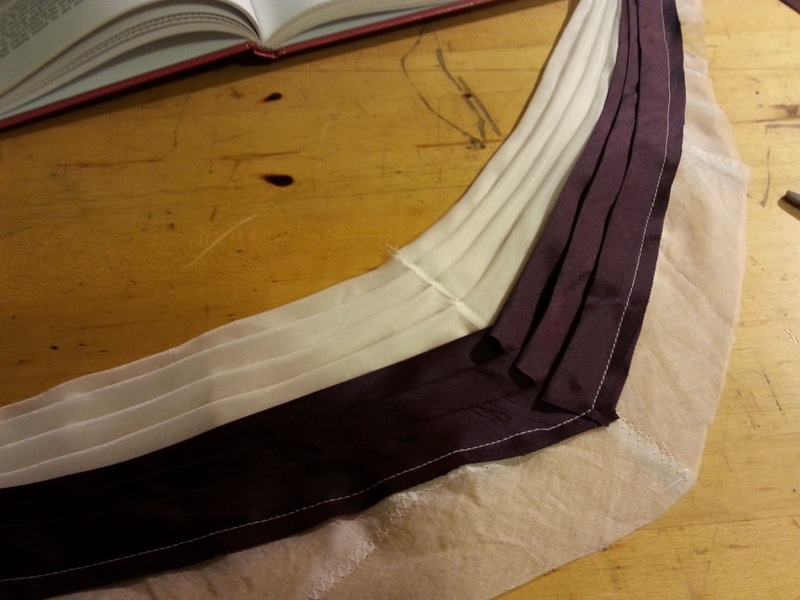 I didn't take the easiest path on this bodice. 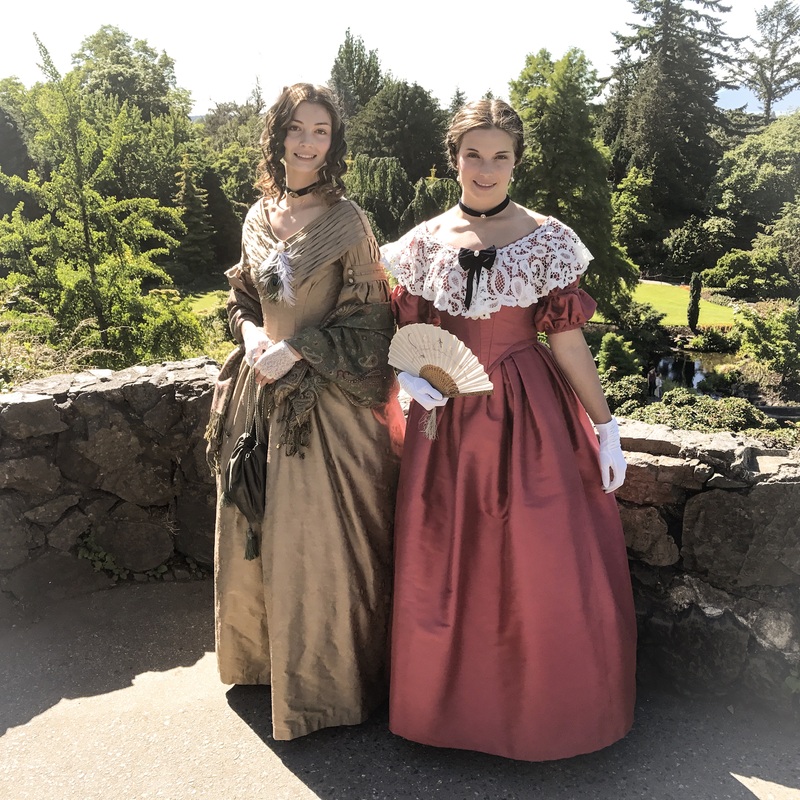 I scaled up a gridded pattern from Period Costume for Stage & Screen: Patterns for Women's Dress, 1800-1909 , using a new-to-me digitizing technique, and after a quick toile (maybe a bit *too* quick), I cut into my silk and stabilizing layer. Well it all worked out in the end, despite fussing with the side seams and performing an impromptu nip-n-tuck on the back pieces. I stitched in some hand-sewn eyelets, and bound the bottom edge in self-fabric piping. 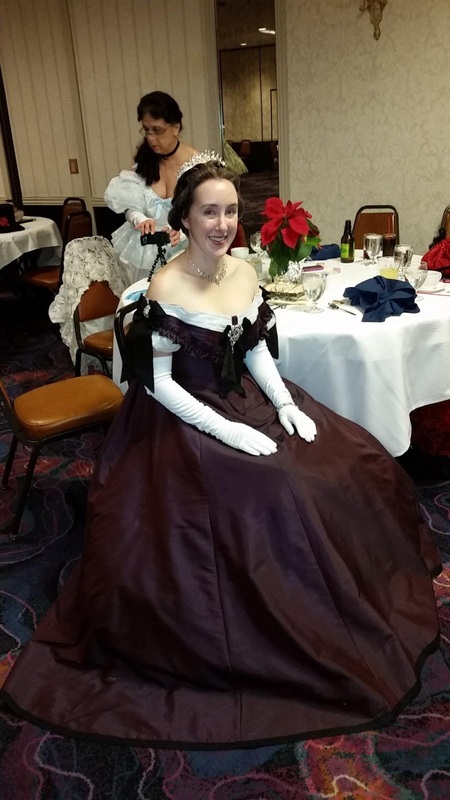 At this point, unadorned, the bodice looked very bridesmaid, which influenced my decision to add sleeves (because I'll avoid them if I can!). Again using Hunisett's instructions, I mounted organza puffs on muslin bases and stitched them in. 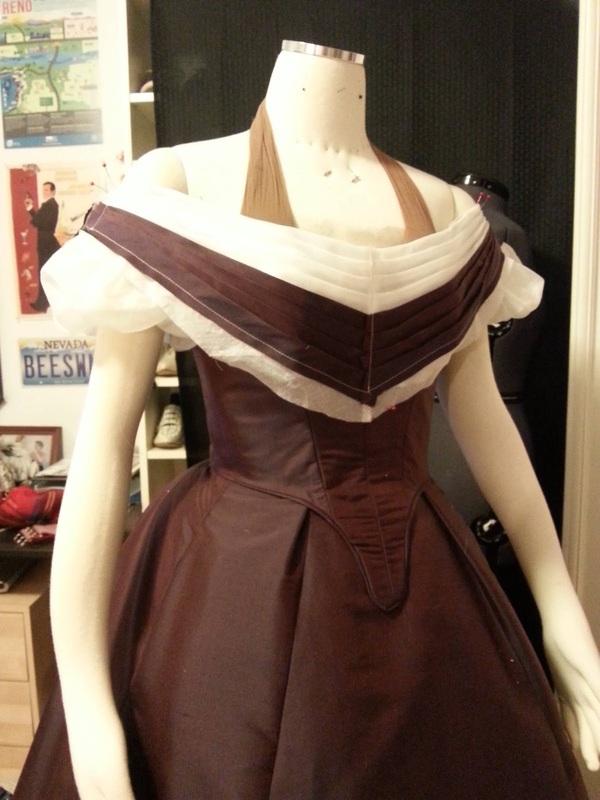 The bodice base without sleeves or any boning int he front point. It looks so...modern. 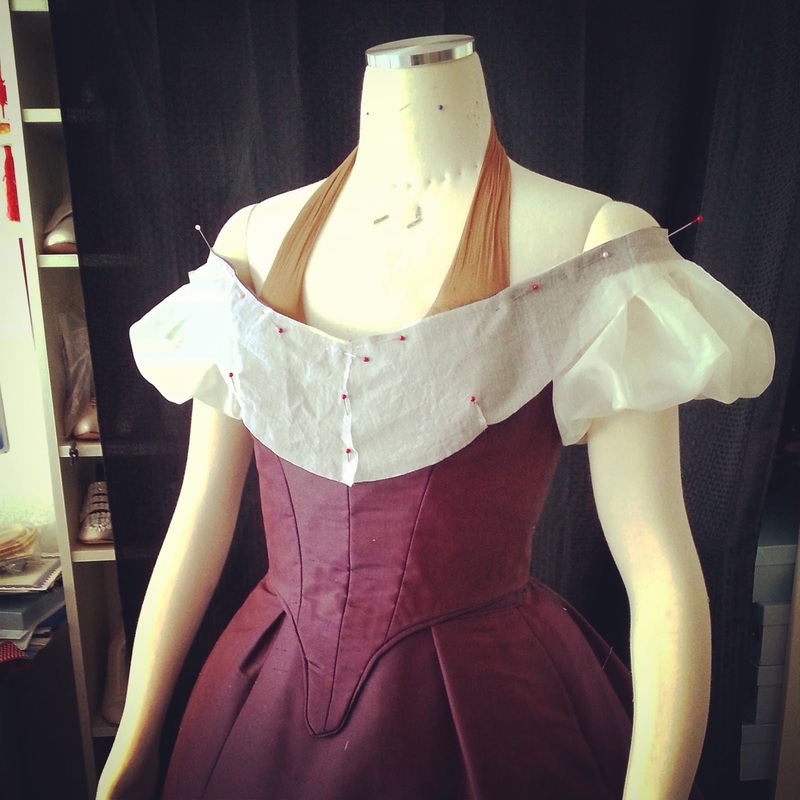 The bodice with the sleeve puffs and the base pieces for the bertha pinned in place. Still no boning in the bodice. It's amazing the effect this little detail had on de-bridesmaiding the design, but the bodice needed the big finale to truly look period - the bertha. 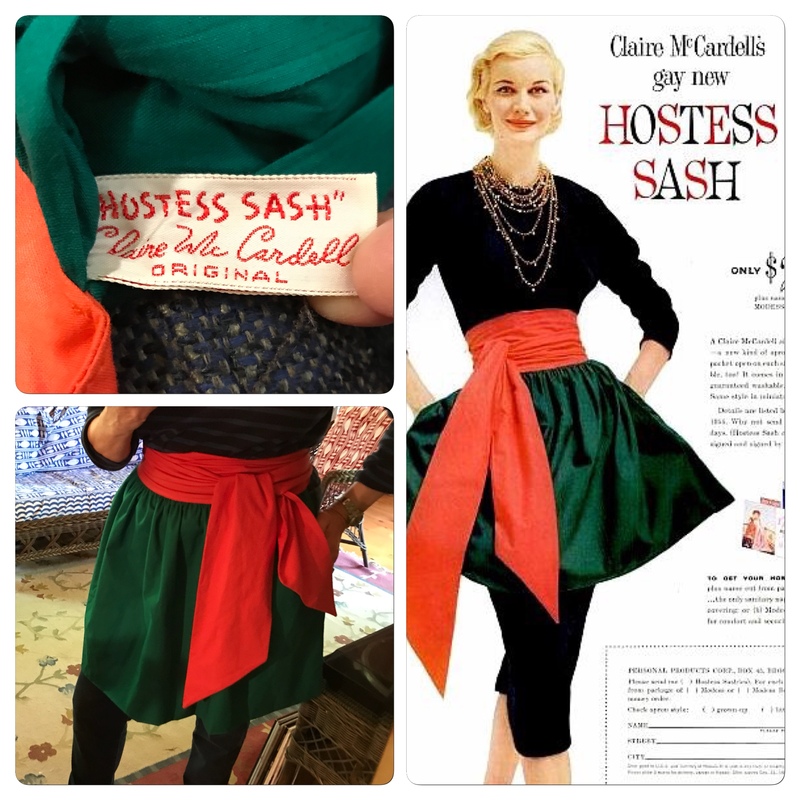 One invaluable tip I picked up from Hunisett and Janet Arnold both was to cut bias strips and lap them onto a base, to create the pleated look of the bertha. I found this method SO much easier than trying to pleat a piece to shape, and gleefully layered on bias strips in the silk and organza, followed by a super-shreddy strip of ruched silk, and some trickier-than-they-look finishing pieces to cover where the berthabits met on the center front and shoulders. Layering bias strips of organza and silk. Note to self - change the friggin' thread color next time, because that sh*t's visible! Ginormous bows and bling finished it, and at least on the dress form the thing looked glamorous. 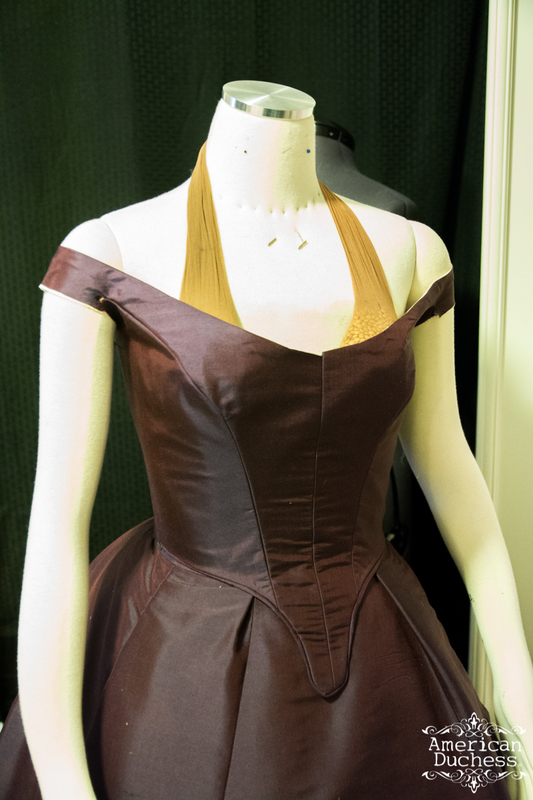 Day of the ball - adding black taffeta bows, big sparkly things, and planning jewelry for the evening. 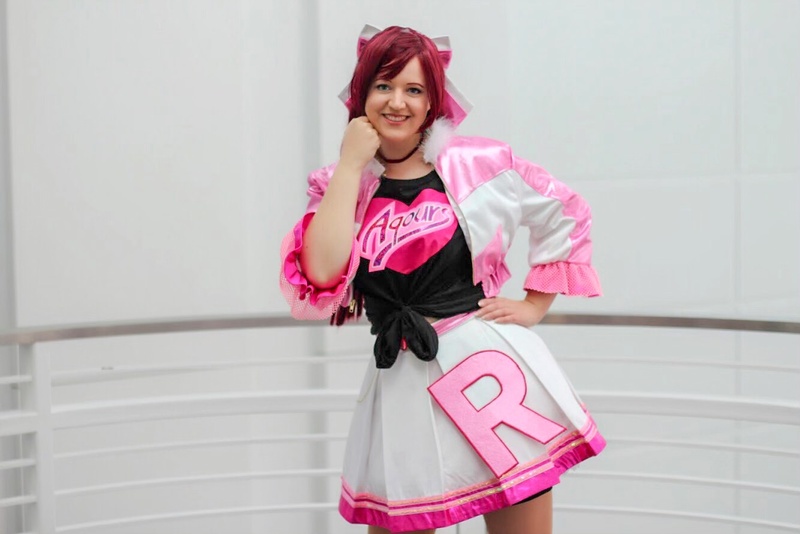 I wheezed a sigh of relief when the bodice fit my actual body like a glove, and everything stayed put, despite the incredibly low-cut design, and constricting shoulder (can I even call them that?) straps. Photo by Kristen - everything stayed put, thank goodness. 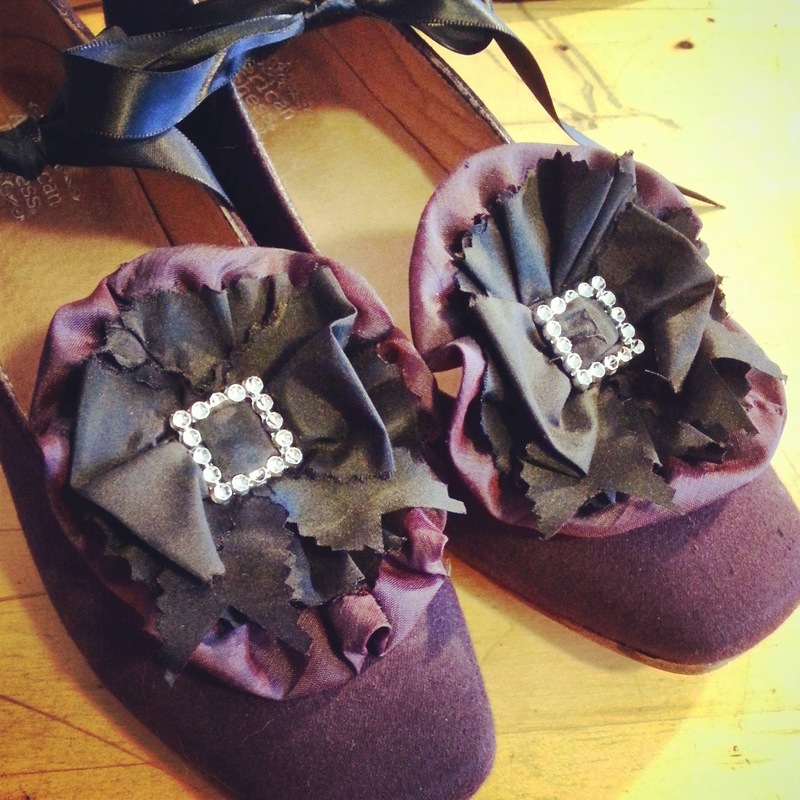 I made little rosette clips for my Tissots dyed to match the dress, and attached a ribbon temporarily under the arch, to tie them on for dancing - this was a very common addition to evening slippers of this and other periods, though more often they were stitched onto the sides of the shoes. Most importantly, I felt wonderful in the gown. 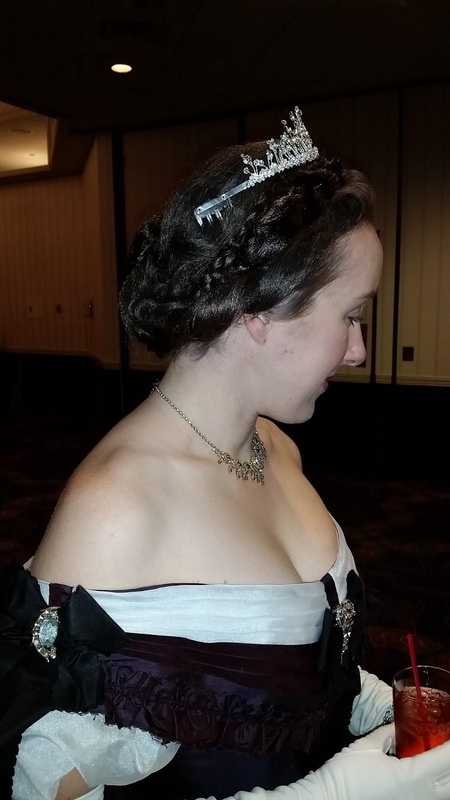 I felt regal and glamorous and graceful, and I can't wait to wear it again! The extra rows of piping is a great idea! Beautiful! I love the stockings too. Do you offer them in your shop? Wow! That is an incredible, beautiful, amazing dress! Great job!! :) It certainly is a humongous relief when the actual dress actually fits you...phew! 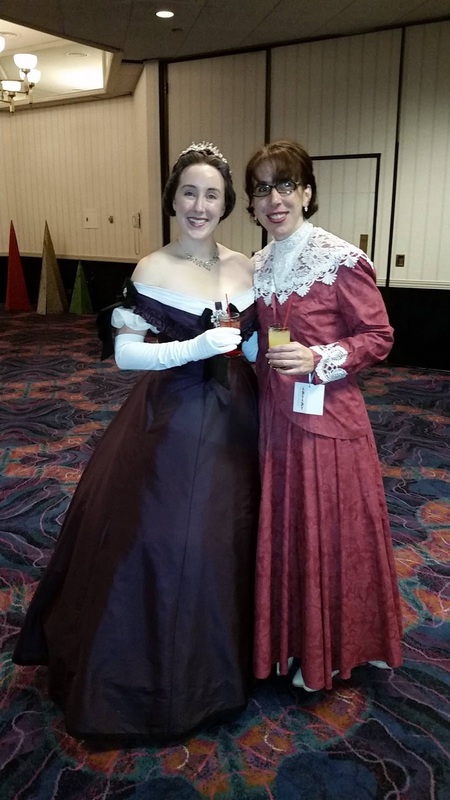 You look very regal and 1860s!! The colour is gorgeous, I like how it changes shades in different lights. 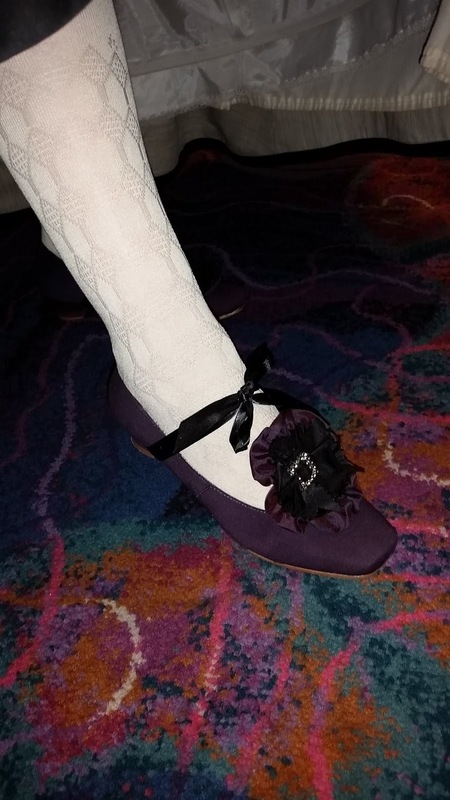 I didn't know about the tying a ribbon to your shoe thing, I actually quite like the look! The dress is just gorgeous! I love the color. Where did you get the gloves? I'm having trouble finding any that come up past the elbow! Thank you! The gloves were a gift and I believe they came from Sacramento Antiques Fair. They have the three buttons at the wrist, and are some kind of cotton, rather than kid. Try Etsy, too. Your dress is beautiful and you look gorgeous in it! WOW, this is fantabulous! The Mertha of all Berthas, I love them they are so romantic, and set the shoulders off so well. 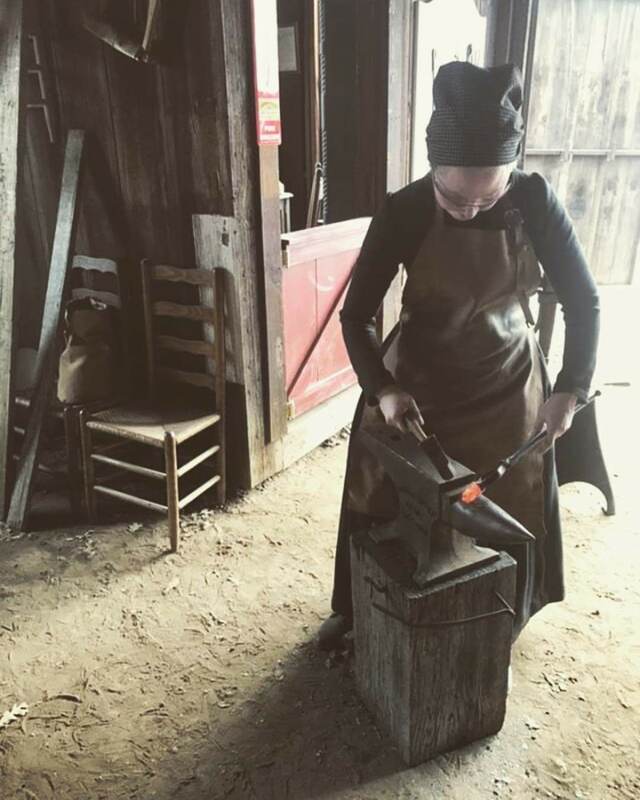 Glorious job, Lauren, well done! 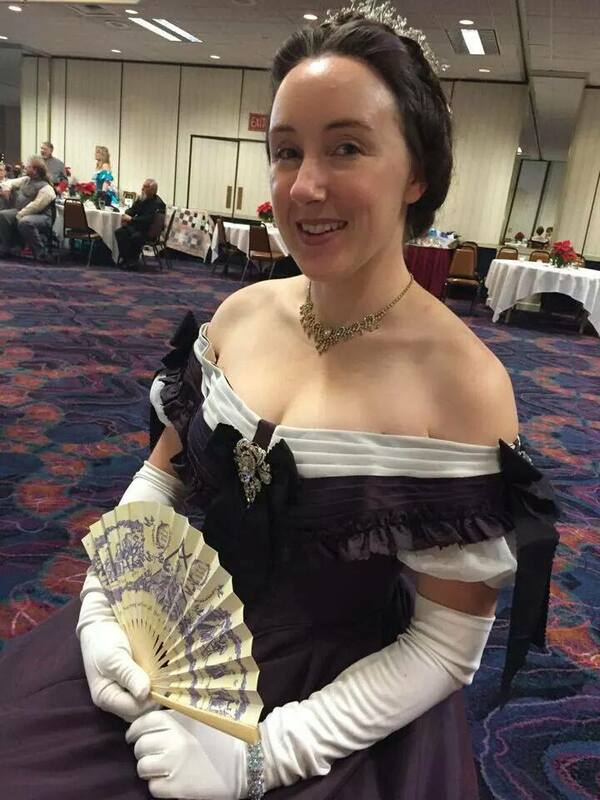 I didn't think I would like the bertha so much, but it really "makes" the bodice, I think. Without it it would look quite boring, really! "Note to self - change the friggin' thread color next time" - I use fabric markers. A lot. It turned out beautiful! 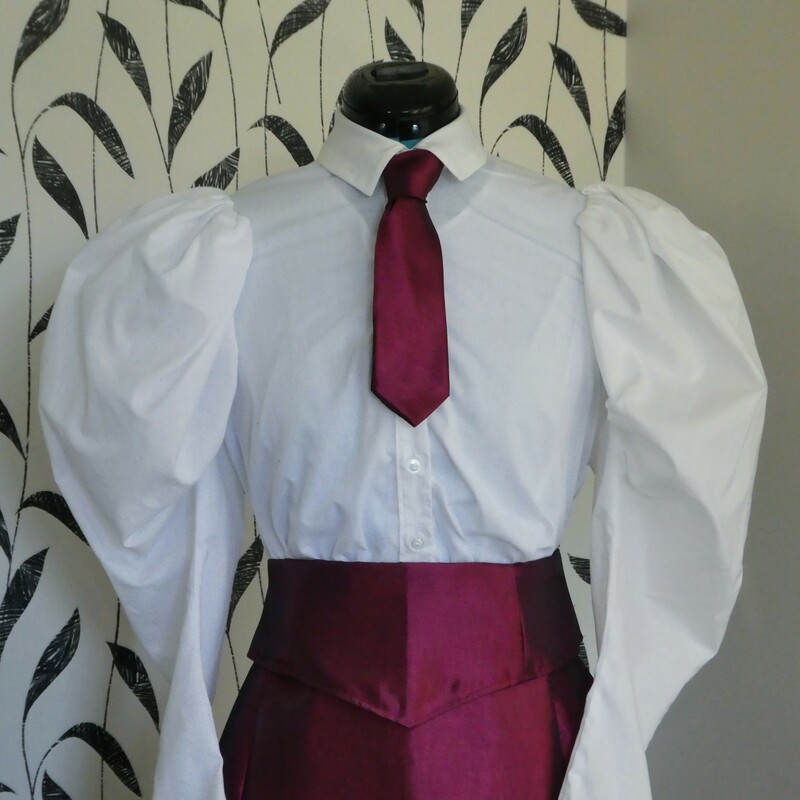 The sleeves definitely finish it off nicely, tying in with the white section of the bertha; they were a good addition! Oh my gosh it's SO much easier than the pleating. You'll be astonished. It takes a little time to cut all the bias strips, sure, but you make it back up in the time saved not fussing with the crazy pleats. Such a beautiful gown. It's amazing how the sleeves and bertha transform it. 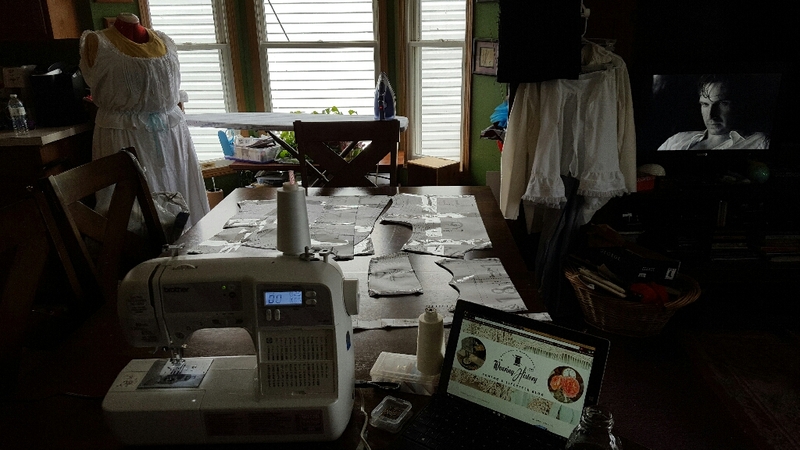 When you say "mounted organza puffs on muslin bases" - are the muslin bases cut to the same shape as the organza, or are they more of a tube shape? Thank you! 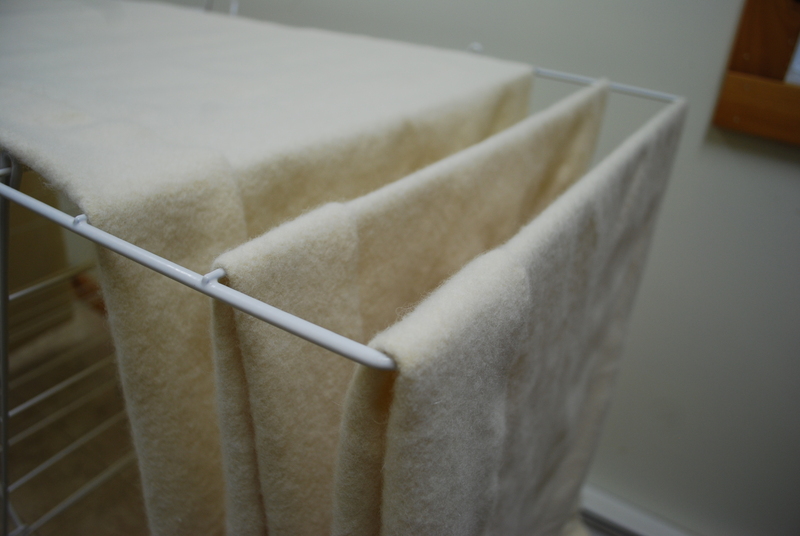 The muslin sleeve bases are tube shapes. 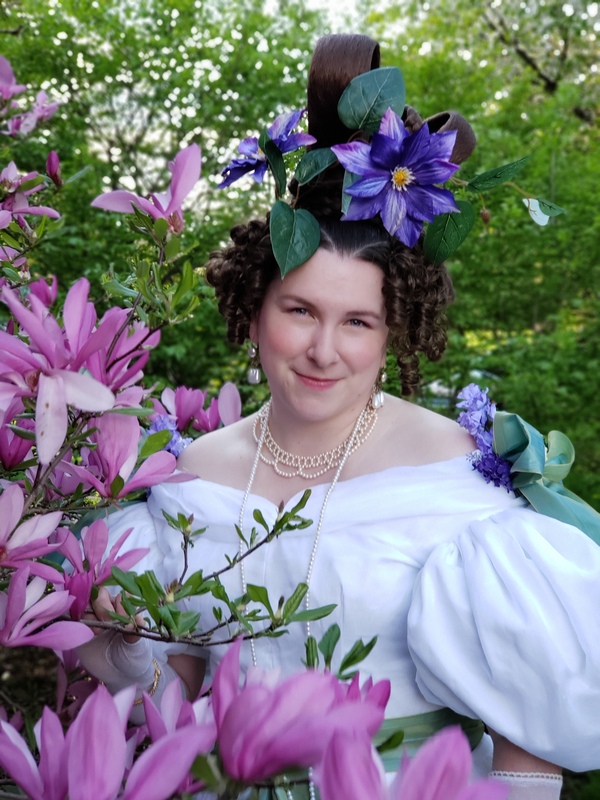 The organza was quite springy, but if you did it with a softer draping fabric like voile, you might want to do a full lining to support the puffs. You look dashing and I love the fabric so much! Such a rich and shimmery fabric, I'd love to get some for myself! GUH i cannot get over how gorgeous this is. You look like a queen! Where did you get your tiara from? 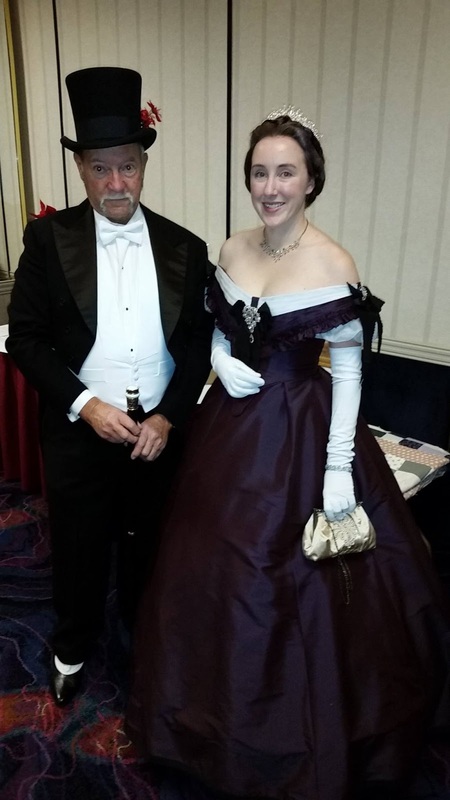 I'm looking for one for a Civil War ball that I will be going to in may. 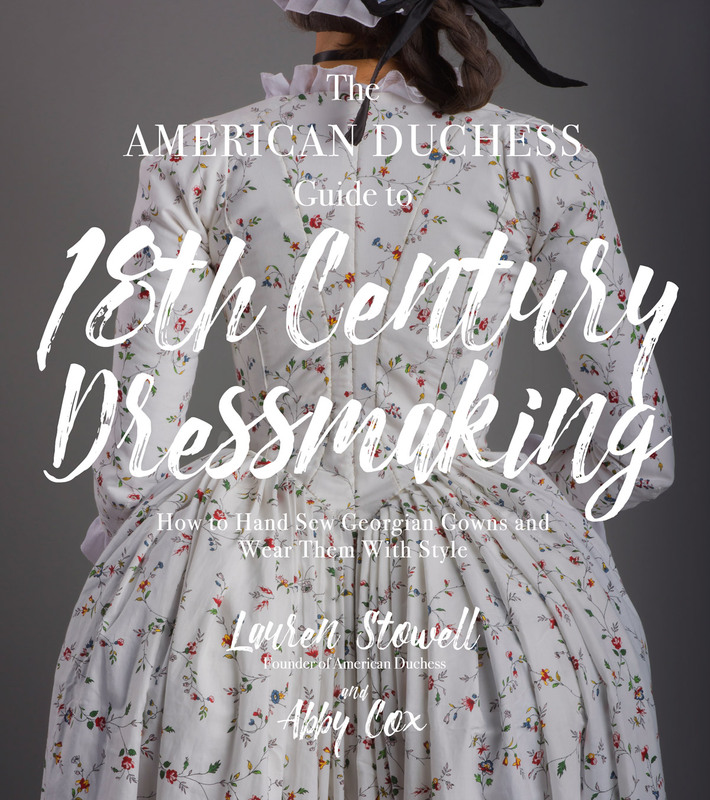 Hi Lauren, I found this whilst researching ball gown bodices for a new project and I was wondering - how practical was the off the shoulder style to wear? I imagine it greatly reduces movement? Hi Emma - Yes, I couldn't raise my arms! That being said, my straps are too low on this bodice. The whole thing is too low, so when I revise it I'm going to take the bertha off, take a couple tucks in the neckline to raise the shoulder straps, and then re-apply the bertha. Thanks, I will take that into consideration when I draft the pattern for mine!